16 wins & 9 nominations. "Before I Disappear" was birthed from director Shawn Christensen's 2013 short film "Curfew," which won Best Live Action Short Film at the Academy Awards that year. I remember watching the short film and simply being captivated by its portrayal of ugly yet realistic characters in a seamy environment, so much so that I called it "a wonderful exercise in style, emotion, human interaction, and existential purpose." With the accolades and recognition "Curfew" received, it was only a matter of time before the short would be adapted into a feature-length project, and, thankfully, the core focus of the film and its characters didn't find themselves lost in translation. This is a film of tone, realism and germane surrealism, and companionship, four ideas that one would assume would make for an awkward, uneven film but mesh so well together thanks to Christensen's carefulness that the end product is something to behold. The film concerns Ritchie (Christensen), an aimless and depressed twentysomething working for a seedy nightclub run by Bill (Ron Perlman). His will to live is waning day-by-day after his girlfriend Vista has mysteriously disappeared, and, upon finding the corpse of a young female in the nightclub bathroom, Ritchie is ready to call it quits. He goes home, fills a bathtub full of water, and proceeds to take a sharp razor and slit his wrists, ending his miserable existence. His suicide attempt is interrupted by Maggie ("Shameless"'s Emmy Rossum), who phones him asking to pick up her eleven-year-old daughter Sophia (Fátima Ptacek, who voices Dora on "Dora the Explorer") from school and look after her while she takes care of other things. Reluctantly, Richie exits hit bloody bathtub, bandages his wrists, throws on old clothes, lights a cigarette and heads off to pick Sophia up. Sophia is exactly the kind of precocious tot that Richie needs in his life, regardless of whether or not he knows it. Sophia is meticulous, organized, and grounded in a world where all there is is homework and poetry. She's drawn realistically and not conjured up from the barrage of clichés one expect from this character. 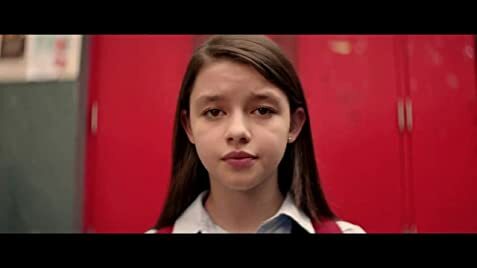 She's sensitively played by Ptacek, who is only fourteen-years-old, and just when you think her character is a caricature, she surprises and comes to be a wonderful addition to not only the story but Richie's life. Richie and Sophia wander the streets, with Richie being hunted by loansharks and mob bosses for his failure to pay back old debts, going from several seedy locations before finding some sort of solace and connection at a bowling alley. This scene is almost identical in structure and setup as "Curfew," but with it being bookended by more familiarity and involvement with the characters, it takes on a greater significance. It provides for a momentary discourse in Richie's miserable existence, as he watches Sophia freely dance down the lane of the alley, with people shaking their hips with bowling balls in their hands at the front of each lane. This adds to the surrealism aspect I mentioned earlier, in that while "Before I Disappear" explores realistically-drawn characters with serious problems and shortcomings, it also welcomes intriguing surrealism into the mix, bending the reality our disillusioned character lives in. Consider when Richie takes a handful of menopause pills (which he believes are sleeping pills that will turn fatal if he takes enough) and hallucinates one of his collectors coming after him; it's one of the greatest surrealist scenes in a film predicated off of being human and realistic. "Before I Disappear" has received the most flak from people who saw "Curfew," weren't a big fan of it to begin with, and then cringed at the thought of watching the short stretched out for ninety-three minutes. Those who enter blindly, and have never seen "Curfew," will likely get the most enjoyment out of it, or those, like me, who enjoy stories about believable and real characters, will find several things to appreciate. Shawn Christensen was a main character and the director of the film.